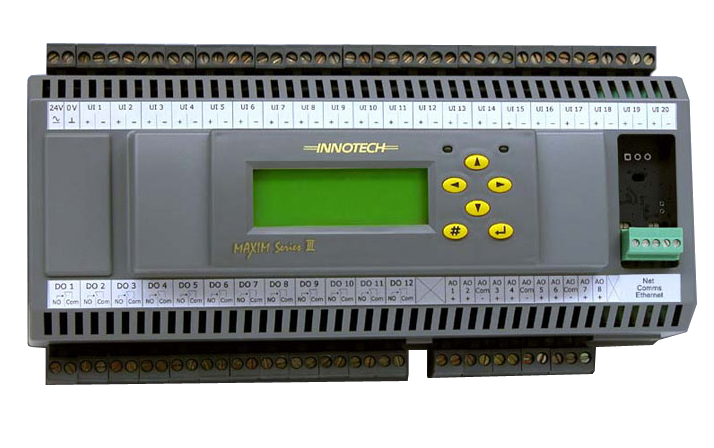 The MAXIM III Controller is a state of the art digital processing system that has the capability of controlling various types of industrial, commercial and domestic systems. The MAXIM III can operate as a standalone device, using its own universal inputs and analogue and digital outputs to receive information and control external equipment, or as part of a network of devices that support Global NetComms. MAXIM III Controllers are designed for mounting inside a control cubicle and offers a varierty of inputs and outputs enabling it to monitor and control all types of external plant and equipment. Although the MAXIM III is flexible, it is primarily designed for the air conditioning and building automation industry. The MAXIM III's configuration program is developed on a computer using a Windows based program. This allows the user to configure the internal processes of the MAXIM III by using a graphical programming tool. The user places various process blocks and interconnecting lines to design the required control algorithm for the system. The configuration program can be downloaded to the Maxim III with an RS485 serial link, using the connector on the right side of the case to link to the computer via a 485/232 converter, or with an optional Ethernet link, using the RJ45 connector on the bottom right side of the case. These links may also be used to upload logged data or the program back out of the controller for modification or debugging purposes. Power Supply 24VAC ± 10% @ 50/60 Hz. 24VDC ± 10%. Transformer nominal rating of 10VA. Temperature Ratings Storage 0 to 50°C non-condensing. Operating 0 to 40°C non-condensing. Communications RS485: 5 way plug in connector for local/remote computer access for purposes of uploading, downloading and monitoring configuration programs and the extraction of logged data, via a 485/232 converter. Ethernet:An optional RJ45 Ethernet port for PC and Internet access to the Maxim III Controller and other devices connected to it in an Innotech Net Comms network. This has the same functionality as an external RS485 to Ethernet Converter.